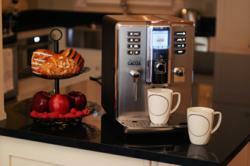 Brew a prefect espresso or latte at home with the skill of a coffee shop barista using a Gaggia espresso machine. From Italy, land of espresso, Total Home Supply is excited to launch its newest line: Gaggia Espresso Machines. When we decided to offer a line of espresso machines, our research showed Gaggia to have a product line offering an option for all consumers, and one where high quality was maintained throughout. As part of their ever-growing line of small appliances, New Jersey on-line retailer Total Home Supply has recently added the Gaggia line to their website. The name Gaggia is synonymous with Italian espresso. Its founder Achille Gaggia patented a steam-free espresso machine in 1938 and was granted the honorary title of “Father of the Modern Espresso Machine.” From that time until the present, Gaggia has continued to revolutionize the industry, creating both an exceptional product as well as a finely designed machine. Featuring both Super-Automatic and Semi-Automatic machines, Total Home Supply offers Gaggia espresso machines at all price points. A quick comparison on the website will narrow down the available options, based on features and price. While Gaggia started its business in the commercial end, their expansion into the home market did not lower their standards. High-end materials and high quality manufacturing fuse together to create an espresso machine built for performance. The end result? That first sip of espresso worth dreaming about.